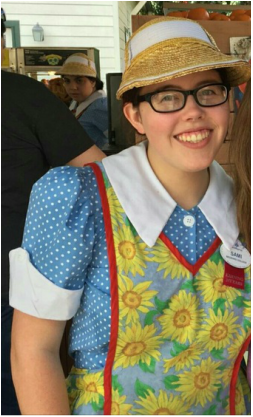 Role Description: I worked in the World Showcase at Refreshment Port, Cool Post (the African part that sells hot dogs), and the Promenade when Flower & Garden didn't have it. Every day that I worked I was either on the register, filling orders by filling drinks, making ice cream, croissant doughnuts, hot dogs, or chicken nuggets & fries, or I was cooking. At the end of the day we had to clean everything as well. Training: After the operations and Discovery Day stuff, I had two days of training at each location and an assessment. Likes: I liked that I had several places to work, especially when I was schedule for Future World even though I was never trained there. I made so many friends working there and we were usually always busy, which made the time go by faster. At the end, I liked getting a lot of hours and I was able to save up a lot, which was nice. The best part of my role was when we would get free food, but it was kinda rare. Favorite Memory: ​We had a frozen lemonade machine at Cool Post that NEVER worked, and one day, I told a girl that it was working and when she turned it on, it got ALL over her. I felt really bad, but it was the funniest thing ever. Role Description: Anything from preparing/cooking the food to handing out and cleaning up after the food. Also slight crowd control in peak hours and a lot of trash cleaning. Training: Four days with the assessment on the fourth day. I got trained two separate occasions. Once for Front of House and once for Back of House. They start you off easy and give you a tour of the restaurant and then gradually teach you harder positions. Free food all four days to let you know more about the products you serve. Likes: Loved being the archway greeter and helping direct customers. Loved making the pizzas and pretty much everything back of house. I also liked being the magic maker because we would make kids sing for free slushies. Favorite Memory: ​At about midnight on the 24 hour day, we noticed that many of the guests were getting drowsy and seemed tired out. In order to pick up the mood, my fellow cast members and I started getting guests to cheer with us. We had nearly everyone in fantasyland cheering with us and it not only brought up the energy but it left a lot of guests with large grins on their faces. Role Description: My location wasn't like other locations, I was trained in seven different quick service locations in Hollywood Studios, serving anything from barbecue to pizza to ice cream. It was split up into two different locations on my schedule, Sunset Market and Sunset Boulevard - if you were scheduled for Market, you'd go back and forth between two locations (or just stay at one location), and if you were scheduled for Boulevard, there were five quick service locations I could have been at, though it wasn't likely I'd be at all five throughout a shift, more like one to three a day. Though some quick service locations only allow you at the front or the back, I did everything from cooking hamburgers in the oven to being at the register to bussing tables to doing the drink orders to giving out the trays of food to guests. It definitely wasn't my first role choice, but I had a lot of fun doing it. Training: My training took about two weeks, a little longer than most quick service people because of how many extra menus and locations I had to learn about. We had a few days of watching videos about guest service, food service, and cash handling at Disney University, then we had about a day and a half of being on the computers at Hollywood Studios getting alcohol trained and watching videos before we could get into our work location. Every new cast member also had park orientation, On With The Show!, to learn about our park, how to get around, and the history behind Hollywood Studios, which was really fun because we got to ride The Great Movie Ride! I spent one day at every single food location and we all rotated between positions, so it was a lot to take in. We would start around 12pm, meet up backstage with our trainer, have a one-hour break where we got to take a drink, dessert, and meal from the location we were training at that day, and we ended the night closing an area the location we were at. At the end of our location training days we were given three hours to be given a test of what we've learned and go back to each location to go over what we were iffy about before a leader brought us over to every location to test us to make sure we knew all the safety procedures and how to make the food so we could "earn our ears". Likes: I liked how Sunset was multiple locations, because that way I never got bored of being in the same place every day. With my role I also liked how I could pick up at any quick service where I had the proficiencies, though I never took advantage of that during my program. What I also liked about my location was that it was super easy to trade and give away shifts, since we had so many CPs (which also led to being able to make friends easier!) and part-time cast members. I also feel like I got really lucky with shifts, I was usually home no later than 11pm and either closed, had day shifts, or left right when the park closed. The only time I was scheduled really late was when there was a cheerleading event at Hollywood Studios and we were open until 2am - that was a fun night! Favorite Memory: ​Ever since high school, I had been wanting to do the Disney College Program. I remember the one thing I had always said was, "I hope I don't get quick service. It sounds terrible!". 9th grade me would be so disappointed that I accepted the role of Quick Service. Quick service really isn't the most glamorous role in all of Disney; people don't think of us as magic makers, and sometimes we're underappreciated, but one night while working I got to make a special Prince and Princess very happy. A family walked over to one of my locations I was at that niht (a giant boat) and asked if they can look inside the boat, thinking it's a playground or store. I see the little boy is kind of disappointed when the person at the register said no and laughed, so I came right outside and asked if he knew Star Wars, and he said yes. I explained there's a light side and a dark side, and if he swore under oath that he's stay true to the light side, I would give him and his sister a special treat. I ran back into the kitchen and grab him and his sister a special blue milkshake, and the look on their faces just made my day so better. We spent a few minutes talking about the light side and who to stick with, and how Kylo Ren may tell you he can teach you the ways of the Force, but he really means the ways of the dark side. Their mom and grandmother thanked me and I told them to have a great vacation, and they went right on their way. I'm not gonna lie, quick service is terrible and exhausting. There were days where it was only thirty minutes into my shift and I was already done with the day and couldn't wait to go home, and then there were days like this where I got to encourage future Jedis to stay with the Resistance. It was amazing because I probably made their night, but really, they made my night. The Disney College Program is such a blessing in my life, and I'm so lucky to have been chosen out of 50,000 people. Before I came up here I didn't think I'd have any opportunity to give guests magical moments just because I work in food, but throughout my four month there, I gave cupcakes to birthday guests, stickers to guests walking by, made families happy just by talking with them while they wait for their food about their day and recommending things to do and places to eat in Disney World, and so much more. Training: it was simple. Just how to work the hot box and take orders. Dislikes: THE HOTBOX! Hated how much I burned my hands. Favorite Memory: ​A little girl drew a picture of me and her holding hands, and we signed our names! !